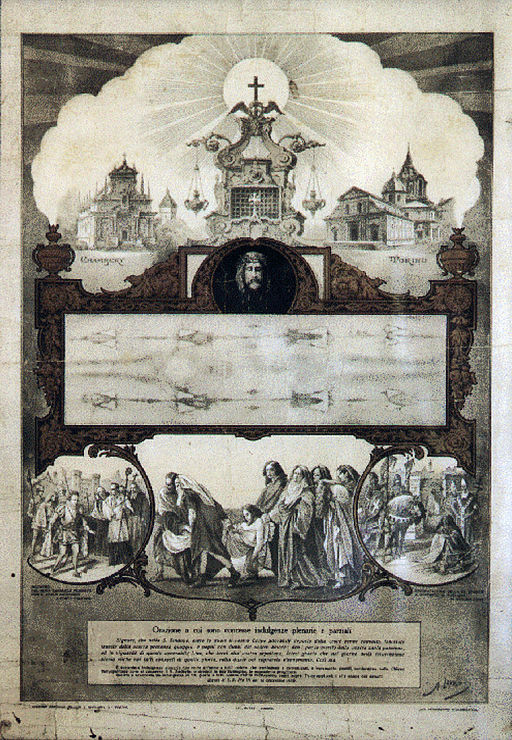 The image of the shroud pictured above is a poster from 1898. By then the images on the shroud were faint. (by Eileen Dombrowski, from OSC TOK blog) This topic of the Shroud of Turin just keeps getting better and better for TOK. In my last post, I outlined TOK lessons based on it. But now – even better materials for launching a class! A podcast interview with historian Charles Freeman (25 minutes), linked from the website of History Today, readily sets up a leaner lesson on the methods of research of an historian. The interviewer applauds Freeman’s research as “historical detective work” on an “unsolved mystery” and invites him to explain his methods of investigation. What accidental discovery triggers Freeman’s investigation of the Turin Shroud? In what ways could you apply to this lucky accident the well-known quotation attributed to Louis Pasteur: “Chance favours only the mind that’s prepared.” ? Notice Freeman’s use of the term “assumptions” – initial premises for constructing an argument, or beliefs so basic that we might not even notice that we’re accepting something without question. What does he say that the “shroudies” assume, and what are the consequences for their explanations? What does he propose as an “assumption” himself? What are the consequences for his own explanation and the areas of research it points him toward? In what ways does Freeman’s “assumption” resemble a hypothesis as used in the sciences? To what extent are the conclusions he reaches based on consistency (coherence check for truth) – consistency between the depiction on the shroud and fourteenth century iconography (iconography = conventions of representation), and consistency between his conjectured use of the shroud and the church practice of the time? How does he put the linen cloth in contemporary context? What early hypothesis does he discard? What evidence persuades him? Why does he favour the context of the Easter ritual? What evidence persuades him? Don’t miss the explanation that Freeman gives of how the shroud might have been first presented as the authentic burial shroud of Jesus Christ. How did Freeman piece together this narrative? How do you think that the documented historical connections might be treated quite differently if the narrative were made into a movie, with the story treated as gripping, a medieval setting, and costumes? After all, it involves the background of the plague of the Black Death and the setting of Troyes (gloriously medieval); a knight away doing battle, his wife, and clergy at the time; initial opposition by the church; possibly miracles attributed to the shroud boosting its status to a venerated object; later display of the shroud to throngs of pilgrims. What is the relationship between the stories pieced together by historians and literature or film based on them? Why does Freeman rule out forgery and deliberate hoax? Why does he think that his research and explanation may be favourably considered by the Catholic Church? Toward the end of the interview, Freeman sums up what he considers to be the role and importance of the Turin Shroud. After all the evidence he has gathered in support of his initial “assumption”, why does he end with a note of caution, “I’m going to be a little cautious, but I think this is the best single explanation of the shroud”? What research does Freeman suggest now needs to be done by appropriate experts to answer further questions that have come up through his own investigation? In what ways has the work done by Charles Freeman benefited from research done by others before him, and in what ways does his own contribution feed into a larger pool of “shared knowledge”? The lessons I outlined in my last post covered considerably more TOK territory, so if you decide to use this podcast in class I’d recommend at least reading through what I said there for perspectives and controversy on the Turin Shroud. Even though the painted linen cloth is medieval according to Freeman — and is 13 centuries earlier according to those who believe it to be the burial cloth of Jesus Christ — the discussions around it are clearly extremely current. With 2 million people expected to visit Turin in 2015 to see the shroud, the cloth and all that is associated with it will continue for at least the next year to be a useful current event for IB Theory of Knowledge. The image of the shroud pictured above is a poster from 1898. This entry was posted in IB Theory of Knowledge and tagged analysis, cause, critical thinking, evidence, history, knowledge questions, literature, methodology, reason, shared knowledge, symbolic representation. Bookmark the permalink.